For one who has conquered his mind, the mind is his friend, but for the jivatma who has no control over his mind, it works against him just like an enemy. Whose friend and whose enemy is the mind? To answer this, Sri Bhagavan is speaking this sloka beginning with the word bandhuh. 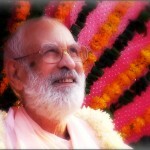 For the atma, that is, the jiva who has conquered his mind, the mind is his friend. But for one who is anatma, whose mind is uncontrolled, it acts harmfully likean enemy. One whose mind is controlled is free from the dualities of heat and cold, happiness and misery, honour and dishonour, attachment and envy. The soul of such a yogi is deeply absorbed in samadhi. Now, in these next three slokas the characteristics of one who is yoga-arudha are being described. A person who is jita- atmanah (one who has conquered his mind) and prasanta (free from attachment, envy and so forth) is properly situated in samadhi and is not disturbed by heat or cold, honour or dishonour. 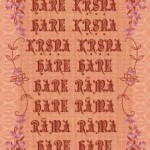 Cakravarti Thakura and Srila Baladeva Vidyabhushana have said that the word parama here indicates intensity. A person whose mind is satisfied by jnana and vijnana, whose consciousness is unaffected by material transformation, who has conquered the senses, and who looks equally upon sand, stone and gold is yoga-arudha, adept on the path of yoga. them, a grain of sand, gold and so on are all the same. One who looks upon well-wishers, friends, enemies, neutral people, arbitrators, envious people, relatives, saintly persons and sinners with equal vision is even more exalted. Suhrid means one who is a well-wisher by nature. 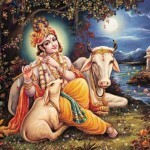 Mitra means one who performs welfare work out of affection. 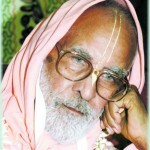 (dharmika) person and papi means a sinful (adharmika) person. One who regards all of these types of people with an equal mind, seeing them all alike, is considered to be a most distinguished and excellent person. Such a person is superior to those who look upon a grain of sand, stone and gold equally. In the previous sloka, a person who has equal vision towards a grain of sand, stone, gold and so forth, was called a yogi. But among persons who are yoga-arudha (ascending the path of yoga), those who see with equal vision a well-wisher, a friend, an enemy, a neutral person, an arbitrator, an envious person, a relative, a saint and a sinner are even more highly situated than those who see inert matter equally.